This Chicken Caprese Burger is the new favorite burger at our house. A grilled chicken burger topped with melty mozzarella, tomato, basil and a flavorful balsamic mayo. It’s a must try burger this summer. 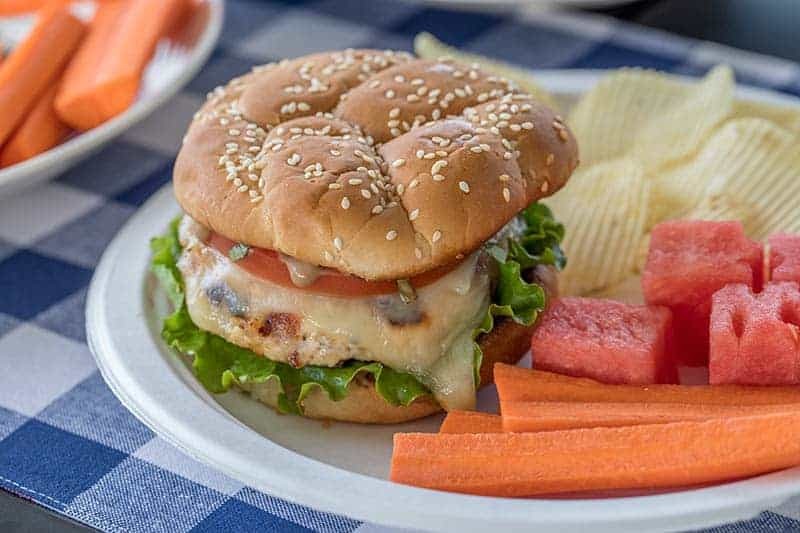 I’ve teamed up with Cache Valley Creamery to create this fantastic Chicken Caprese Burger. Cache Valley Creamery has been producing great cheeses for over 75 years. 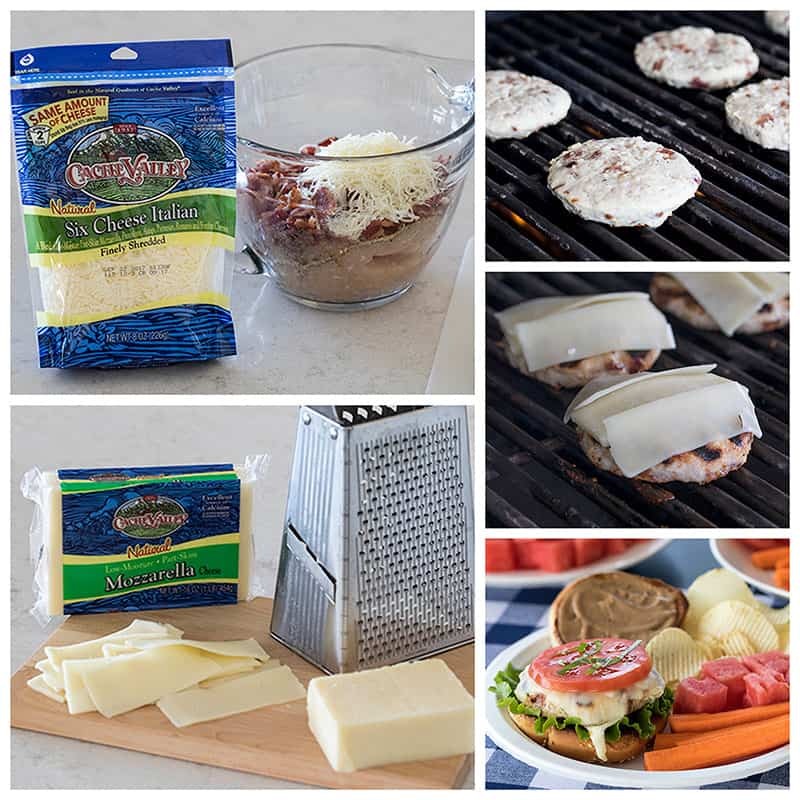 I used two of their flavorful cheeses in this recipe–their finely shredded Six Cheese Italian cheese in the burger and slices of their Mozzarella to top the burger. My daughter doesn’t care for ground beef, so this burger starts with ground chicken. Then I mix in bacon, bacon grease, lemon pepper seasoning, and Cache Valley Six Cheese Italian cheese so the chicken is flavorful, stays juicy and doesn’t fall apart. The chicken cooks pretty quickly on the grill, but be sure and pre-heat the grill so you’ll get some great grill marks. You’ll also want to have your Mozzarella sliced and ready to use so you don’t overcook the burgers. Cache Valley dairy products are sold at retailers throughout Utah, including Walmart, Smith’s, Macey’s, Fresh Market, Harmon’s and more. I grew up eating Cache Valley cheese and still love it today. If you aren’t in Utah, substitute your favorite local cheese. But don’t let grilling season end without trying this burger! 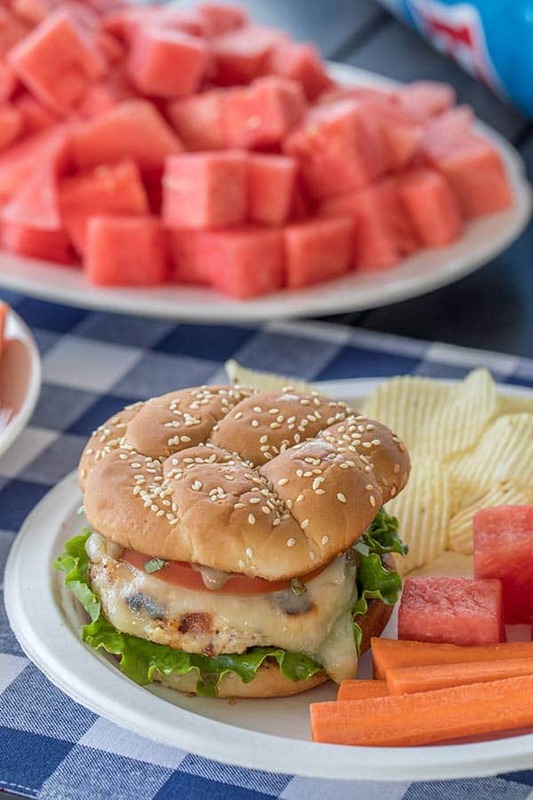 This Chicken Caprese Burger is the new favorite at our house. A grilled chicken burger topped with melty mozzarella, tomato, basil and balsamic mayo. Prepare balsamic mayo: mix together all ingredients in a small mixing bowl and refrigerate until ready to use. Fry the bacon until crisp but not crumbly. Reserve 2 tablespoons of bacon fat. In a large bowl, combine the reserved bacon fat, ground chicken, bacon, Six Cheese Italian cheese, and lemon pepper. Form into 6 patties the size of your buns. Grill the burgers, turning once, for about 10 minutes until the center of the burgers is 165 degrees. Just before the burgers are done, toast the buns on the grill or under the broiler. Turn off the grill and top each burger with slices of Mozzarella cheese. When cheese is melted, remove from the grill. Place a lettuce leaf on each bun bottom, top with a burger, a slice of tomato, additional salt and pepper if desired, and basil. Spread balsamic mayo on the top half of the bun and place on top of tomato. Disclosure: This post is sponsored by Cache Valley , but all opinions expressed are always my own. You can also find Cache Valley Cheese on Facebook. Now that is some cheesy goodness! And what a great idea to top the burgers with a balsamic mayo. This looks absolutely stunning. Definitely gonna try this recipe in the next BBQ party. I love Caprese, I love burgers….this is a winner of a recipe for sure! It’s on for my next BBQ. I love ANYTHING Caprese! Always looking for more burger ideas too, so these are happening! Yes please….and thank you. Every once in a while we enjoy a switch out from the usual burger. I love new ideas for chicken burgers and this one looks like a winner. I mean really, how can you go wrong with chicken and bacon? And that mayonnaise sounds delicious.